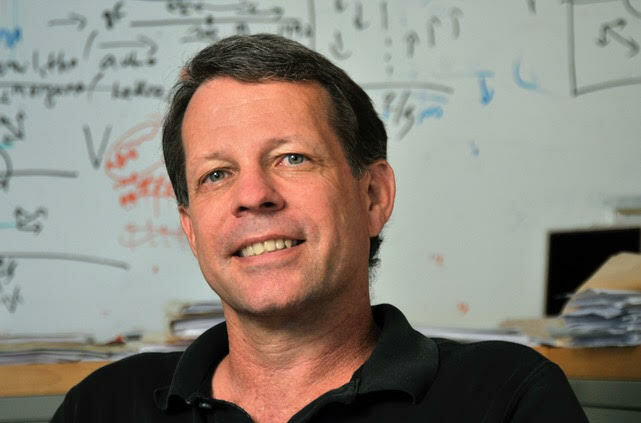 Dr. Edward DeLong is a Professor in the Department of Oceanography at the University of Hawai’i Mānoa as well as a Visiting Professor in the Department of Civil and Environmental Engineering at MIT. Ed received his B.S. in Bacteriology from the University of California, Davis and his Ph.D. in Marine Biology from the Scripps Institute of Oceanography. Afterwards, he conducted postdoctoral research at Indiana University. Ed has worked as a research scientist at the Woods Hole Oceanographic Institute, a faculty member at the University of California, Santa Barbara, a research scientist at the Monterey Bay Aquarium Research Institute, and a faculty member at MIT before accepting his current position in Hawai’i. His honors and achievements include the Office of Naval Research Young Investigator Award, the DuPont Young Faculty Award, the Apple Bioinformatics Cluster Award, the Vladimir Ivanovich Vernadsky Medal of the European Geosciences Union, the Proctor and Gamble Award in Applied and Environmental Microbiology, American Society for Microbiology D.C. White Research and Mentorship Award, the UC Davis College of Biological Sciences Outstanding Alumni Award, A.G. Huntsman Medal for Excellence in Marine Science, and the Moore Foundation Marine Microbiology Investigator Award. Ed is also an Elected Fellow of the American Academy of Arts and Sciences, the National Academy of Sciences, the American Association for the Advancement of Science, and the American Academy of Microbiology. Ed has also been elected as an Associate of the European Molecular Biology Organization and is the Vice President and President Elect of the International Society of Microbial Ecology. In addition, he currently serves as the co-director of the Simons Collaboration on Ocean Processes and Ecology (SCOPE). Ed joined us for a conversation about his experiences in life and science. When he’s not working, Ed loves to be out in nature. He enjoys spending time outside with his family, hiking, kayaking, and snorkeling in the beautiful coral reefs near his house. Ed has also taken up yoga to help him stay limber and relaxed. Research in Ed’s lab brings together a variety of disciplines to study microbial communities in the ocean. He is interested in their ecology, evolution, biochemistry, genomics, and their impacts on marine systems. Particularly of interest for Ed are the microscopic organisms that are the primary producers or “forests of the ocean” responsible for releasing oxygen and serving as food for other organisms in marine food chains. Ed has always been drawn to the sea. He grew up relatively close to the ocean in California and remembers going to the coast with his family. Though Ed’s love of water as a kid resulted in him having to be saved after crawling into the deep end of the pool twice when he was two years old, this passion has been a big influence at all stages of his life. Watching Jacques Cousteau on TV exposed him to the excitement of ocean exploration and discovery. By seven years old, Ed decided he wanted to become a scuba diver. He realized this dream when he turned seventeen. Ed pursued a degree in microbiology in college, and he was excited to realize he could combine his microbiology interests with studying the ocean through oceanography. One challenge for Ed is that is that his research is complex and it deals with things that people can’t see. As a result, his work isn’t intuitive, and it can be difficult for Ed to describe his work to people outside the field. In ecological systems on land, there are a lot of great examples you can describe to help people understand ecological systems. For example, people can imagine and connect with the idea of a lion hunting on the Serengeti, but he is studying the ecology and complex communities of microorganisms in the ocean that aren’t visible. In addition, Ed’s work includes elements of microbiology, molecular biology, genomics, chemistry, physics, oceanography, and ecology, so there are many complex factors involved. In one of their projects about 18 years ago, Ed and a former postdoc began sequencing genomes of ocean microbes to try to better understand them. At that time, genomic technologies were more primitive. However, they figured out a way to get large genomic fragments from marine microbes that couldn’t be grown in the lab, and they looked at the genes associated with these large genome fragments. This was more of a random genomic approach, and they didn’t know whether they might discover something or not. What they ended up discovering was remarkable, and it changed the way people think about how microbes survive and contribute to the food chain in the surface layers of the ocean. They discovered a gene for a protein in these bacteria that can capture and make energy from light. This process was previously unknown in marine microbes, and it is important ecologically in for understanding how the whole food web works. Later, it became evident that the gene they discovered is present in more than half of bacteria near the surface of the ocean. Traveling to Antarctica was a remarkable experience. When his first grant as an Assistant Professor was funded in the 1990s, Ed and his two graduate students went to Palmer Station on the Antarctic Peninsula. Ed was awed by the raw and unspoiled natural beauty of the continent. He and his students had to collect ocean water samples to study the microbes they contained, but there were two meters of sea ice covering the ocean near the coasts. As a result, they had to cross country ski across the sea ice pulling sleds with large bottles for their samples. Once they found a suitable location, they drilled a hole through meters of sea ice, used bilge pumps to draw water samples, pack the large bottles onto their sleds, and hauled the sleds back across the sea ice. Once back to Palmer Station, they could begin doing their research studies. The whole process of exploration and discovery reminded Ed of the old Jacques Cousteau shows he used to watch. On the trip described above, they didn’t actually make it to Antarctica on their first try. They made the journey on an icebreaker ship that allowed them to break through the thick sea ice. When they were near the Antarctic Peninsula, the winds changed and the ship became wedged between huge amounts of sea ice. They were stuck. This was Ed’s first major research project, and he had to fight back the urge to panic. For fourteen days, Ed, his students, the crew, and the other passengers had to figure out how to occupy themselves on this ship. Ed spent a fair amount of time pedaling off his anxiety on the ship’s exercise bike, but he also contributed an advice column to the daily newspaper that one of the passengers put together everyday. The newspaper was a fun way to keep people busy and keep everyone informed of what was happening on the ship. People really started getting into it. One night, the winds randomly changed again, and the ship was free. They ended up having to return to South America to refuel before attempting the voyage to Antarctica a second time. Follow your passion. If you can identify what you are most passionate about and excited to do every day, stick with it. If you can combine your passion with your career, you’ll be happy and will likely do well because you will will create an environment in which you can be successful. Ed’s central scientific efforts have been devoted to the study of microbes and microbial processes in the ocean, combining new techniques in genomics, functional genomics, metagenomics, and computational biology with field‐based approaches in microbial oceanography. Most recently, Ed has been integrating ‘omics and bioinformatic approaches with autonomous, in situ sensing and sampling technologies, to map and quantify microbial plankton gene expression and dynamics, and assess the impacts of microbial communities on biogeochemical and oceanographic processes. Outside of work, Ed enjoys being in nature, hiking, kayaking, free diving, and being a dad. Ed maintains a deep interest in various Eastern philosophies, and how it relates to the paradoxes and problems of modern society.